In 2012 BMW took the wraps off of the Active Tourer concept. While most were fixated on the fact that we were seeing BMW’s first front wheel drive car, it was the drivetrain that was truly the revolutionary part of the concept. 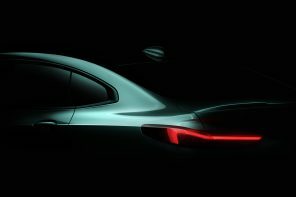 Based on sources we expect this hybrid drivetrain to arrive in plug-in form sometime next year in the recently released 2 Series Active Tourer. At the heart of the new Hybrid will be a 1.5L three cylinder lifted from the F56 Cooper and 2 Series Active Tourer and powering the front wheels. Integrated into that will be a plug-in hybrid system (likely derived from the BMW i8) powering the rear wheels only. The synchronous electric motor will likely have a electric only range of around 15-20 miles that would be ideal for urban environments. The beauty of that arrangement is the torque (which is abundant in electric motors) won’t overwhelm the front tires and instead will provide additional power in the most effective way – to the rear. Not only will power and torque be better distributed but it will also allow for better weight distribution across the entire car. The system that BMW has previously shown had an output of “over” 140 kW/190 bhp. Doing the math backwards (and assuming MINI won’t detune the 134 hp Cooper 1.5L engine) we can expect the electric engine will have around 60 hp by itself. Given these numbers (and adding the extra weight of the system) we’d expect 0-60 times in the low 7s. 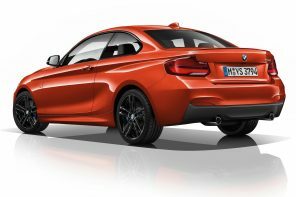 More importantly BMW has said it expects the system to achieve a fuel consumption of less than 2.5 litres per 100 kilometers (94 mpg, 113 mpg imp), with a CO2 emissions level of less than 60 g/km. Granted those figures will be altered for the US based on the EPA’s own measurement but they will still be similarly astounding in production form. According to BMW’s published report on the concept power plant, the electric engine has been developed in-house at BMW. With a fully charged battery, the electric only range should be over 30 kilometers giving the Clubman Plug-In Hybrid the ability to be in 100% electric mode for the majority of day-to-day trips that don’t involve high speeds. What’s more interesting, BMW has created a boost function that could be thought of as DRS or a “Push to Pass” system. It gives the petrol engine a sudden boost of power for what BMW calls “highly dynamic acceleration man oeuvres” – BMW’s words, not ours. With this system the power is made available “spontaneously and without delay”. The best part? The maximum torque of 200 Newton metres is available from standing. The hybrid system’s lithium-ion battery can be charged at any 220 volt household power socket. Time for a full charge hasn’t been published yet nor has time to charge from higher voltage sockets. 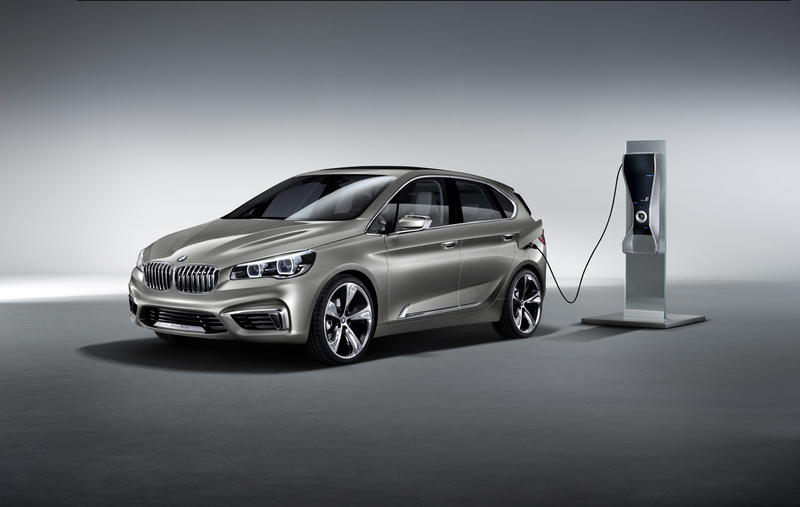 Regenerative power can be drawn from both axes of the BMW Concept Active Tourer and fed back into the lithium-ion battery so as to enhance the efficiency of the plug-in hybrid. While the electric motor automatically recuperates maximum energy at the rear axle during deceleration, a high-volt generator connected to the combustion engine additionally charges the battery whenever needed. Naturally we expect that same tech to make it to production. As part of the BMW Group’s typical Efficient Dynamics strategy, the hybrid system will use data provided by the navigation system, calculating in advance the most suitable sections of the route and driving situations in which to apply electric drive or charge the battery. This optimized charging strategy saves up to 10% of energy so as to extend the amount of travel time during which the vehicle runs on electrical power alone. Additionally the default ECO PRO mode aims is to maximize range in all-electric mode, something that is achieved by minimising the energy consumption of the ancillary units. To this end, ECO PRO mode will reduce the output of the air conditioning and other electrically operated comfort-enhancing functions when appropriate. If MINI uses the functionality that is found on BMW’s electric i3, ECO PRO could also provide driving tips, and the Bonus Range Display shows how many additional miles can be added to the car’s range by keeping to the fuel-economy-maximising ECO PRO mode on. Additionally BMW will likely use the i3’s Proactive Driving Assistant that works with the Nav to anticipate local conditions and send the driver tips to prepare for the situation ahead. In that car ECO PRO Route also plays its part in minimising fuel consumption by setting out the most efficient route based on volume of traffic, personal driving style and local conditions. We expect the debut of the hybrid system to happen in conjunction with the MINI Clubman sometime next year. Pricing is obviously not yet determined but given the performance and efficiency promises, this model will surely sit atop the 2 Series Active Tourer range. Previous article2 Series Active Tourer: A Brand Killer or a Masterstroke? Does BMW Need a New Z4 M Coupe?